Autumn is finally here and I have been switching up my skincare routine in order to keep up with the changing season. It's this time of year when my skin starts to feel more parched and lacklustre, so although I go through several different skincare products throughout the seasons, I thought I would share with you my current staple picks. To treat all my dull skin woes, I have cracked out the Oskia Renaissance Cleansing Gel, a sweet scented cleanser that turns into a lightweight oil to nourish, clarify and add glow to the skin. Although I've always had a bottle of this in my cupboard and I've used it off and on for over a year now, I go through phases with how my skin reacts to it. At the moment I like to use it after my first cleanse and exfoliator as it promotes a natural radiance and perks up my complexion instantly. Now that the colder weather is starting to set in, I have been dedicating more time to finding the right moisturiser. 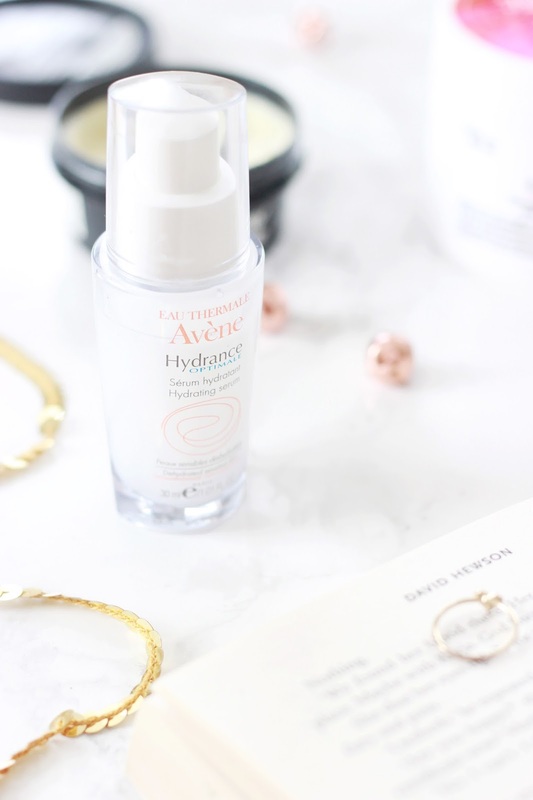 I have been thoroughly enjoying the Avene Hydrance Optimal Hydrating Serum*, a highly concentrated boost of hydration that soothes and leaves the skin feeling supple. I often opt for an oil when I want to layer up, as I find serum's can often just sit on top of the skin without allowing my skin to reap any of the benefits. I particularly like pairing the Avene offering with the Kiehl's Ultra Facial Cream* for a lightweight, yet intensity nourishing duo. This dreamy pair can be applied just before makeup or during your night time routine for a perfect hydrated base. Aside from a layer of the Aesop Resurrection Hand Cream* every now and again, I tend to neglect my hands especially during the colder seasons. I have been putting the Lush Lemony Flutter cuticle butter next to my bed every night to encourage me to apply it just before I settle down with a book. This is perfect at softening any hard bits or neglected areas you might have including your heels, elbows and hands, delivering softened, nourished and citrus smelling skin. What are your current skincare staples?